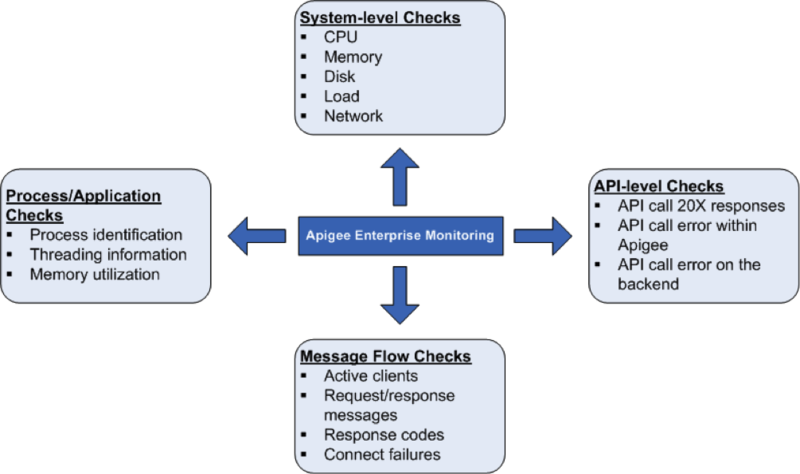 Apigee-specific Java Server Services: These include Management Server, Message Processor, Qpid Server, and Postgres Server. Third-party Services: These include Nginx Router, Apache Cassandra, Apache ZooKeeper, OpenLDAP, PostgresSQL database, and Qpid. CPU Utilization: Specifies the basic statistics (User/System/IO Wait/Idle) about the CPU utilization. For example, total CPU used by the system. Free/Used Memory: Specifies the system memory utilization as bytes. For example, physical memory used by the system. Disk Space Usage: Specifies the file system information based on the current disk usage. For example, hard disk space used by the system. Load Average: Specifies the number of processes waiting to run. Network Statistics: Network packets and/or bytes transmitted and received, along with the transmission errors about a specified component. This helps you to provide dashboards for the API message flow. For more, see How to Monitor. Where MP_IP:PORT is the IP address and port number of the Message Processor.